The organization is currently preparing for a review of cannabis scheduling and classification at its November meeting with a recommendation from this summer that CBD had no addictive properties. In a sign that cannabis reform is now on the march at the highest level of international discussion, the World Health Organization (WHO) will be meeting in November to formally review its policies on cannabis. This will be the second time in a year that the organization has met to review its policies on the plant, with a direct knock-on effect at the UN level. What Exactly Will The WHO Review? Pure CBD should not be scheduled within International Drug Control Conventions. Cannabis plant and resin, extracts and tinctures of cannabis, Delta-9-THC and isomers of THC will all be reviewed in November. Finally, and most cheeringly, the committee concluded that “there is sufficient information to progress Delta-9-THC to a critical review…to address the appropriateness of its placement within the Conventions.” In other words, rescheduling. Translation beyond the diplomatic niceties? The drug war may, finally, and at a level not seen for more than a century, come to a close internationally, on cannabis. 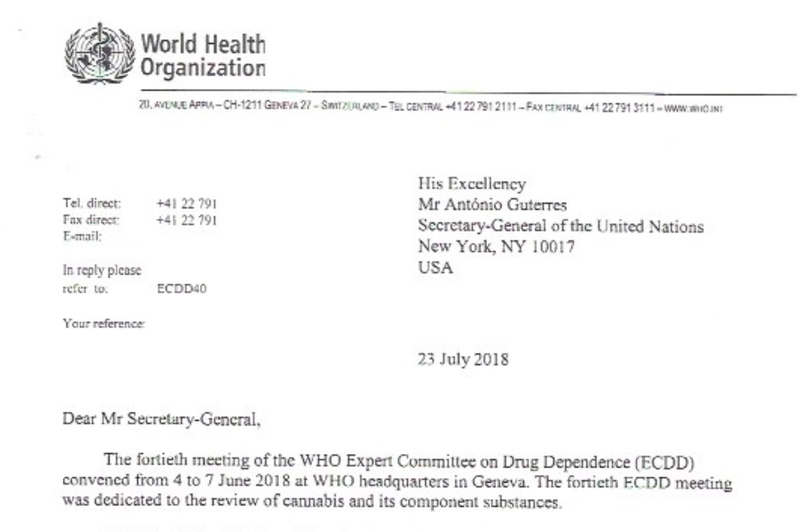 Here is why: The WHO is effectively examining both the addictive impact and “harm” of the entire plant, by cannabinoid, while admitting, already that current scheduling is inappropriate. And further should not apply to CBD. This also means that come November, the committee, which has vast sway on the actions of the UN when it comes to drug policy, is already in the CBD camp. And will finally, it is suspected, place other cannabinoids within a global rescheduling scheme. AKA removing any justification for sovereign laws, as in the U.S., claiming that any part of cannabis is a “Schedule I” drug. What this means, in other words, in effect, is that as of November, the UN will have evidence that its current drug scheduling of cannabis, at the international level, is not only outdated, but needs a 21stcentury reboot. From a calendar perspective, in what will be Canada’s first recreational month, Britain’s first medical one and presumably the one in that the German government will finally accept its second round of cultivation bids, the world’s top regulatory body will agree with them. This also means that as of November, globally, the current American federal justifications and laws for keeping cannabis a Schedule I drug, and based on the same, will have no international legal or scientific legitimacy or grounding. Not that this has stopped destructive U.S. policies before. See global climate change. However, and this is the good news, it is far easier to lobby on cannabis reform locally than CO2 emissions far from home. See the other potentially earth-shaking event in November – namely the U.S. midterm elections. The global industry, in other words, is about to get a shot in the arm, and in a way that has never happened before in the history of the plant. And that is only good news for not only the industry, but consumers and patients alike.